The government would do infinitely better to focus on providing a better, modern and empowering education. 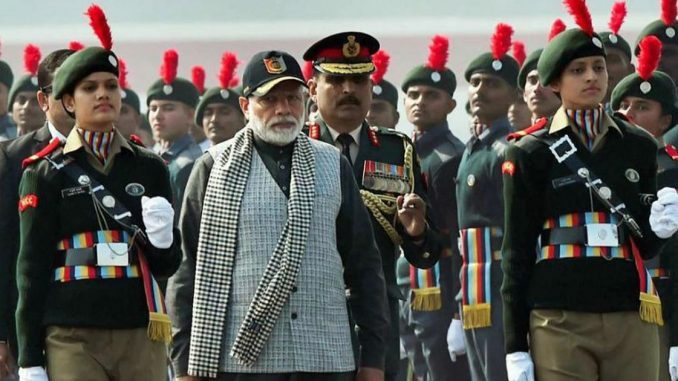 The government plans to instil discipline and nationalism in a 10-lakh-strong “force of youth” each year, as part of a programme called National Youth Empowerment Scheme or N-Yes, The Indian Express reported on July 17. N-Yes, according to initial disclosures, is intended not only to provide “military training” but also “vocational and IT skills, disaster management and Indian values through yoga, ayurveda and ancient Indian philosophy”, and would be an “essential qualification for jobs in defence, paramilitary forces and police”. The scheme is to be financed by the “existing budget” for the National Cadet Corps and National Service Scheme, as well as funds available with the Skill Development Ministry and with schemes under the Mahatma Gandhi National Rural Employment Guarantee Act, the report said. The radicalisation and militarisation of youth, even very young children, is characteristic of many authoritarian and most contemporary extremist and terrorist movements. Crucially, in ideologically-driven states, “youth movements” have sought to harness the young to the agenda of ruling political formations or of charismatic leaders. Over four years of Prime Minister Narendra Modi’s rule in New Delhi and an augmenting tally of Bharatiya Janata Party-controlled state governments, there have been disturbing signals with regard to “youth mobilisation”, much of it oriented to communal and caste polarisation, intimidation and disorderly, sometimes extreme, violence – though other parties are not innocent of a similar perversion of political processes. There have, moreover, been visible efforts tending to the progressive marginalisation, subversion or ideological capture of state institutions by the ruling party and its proxies. Against this background, N-Yes has swiftly provoked cries of “fascism”, and dire warnings of a conspiracy to “slowly infiltrate the nooks and crannies of a nation with secret armies”. The argument goes that instead of generating jobs, “the government is apparently planning to channelise its human and financial resources for creating militias”. The government has dismissed the criticism as an attempt to sensationalise and distort facts, and reiterated that N-Yes is only intended to revamp the National Cadet Corps and National Service Scheme, and to discover how “youth could be empowered through these institutions”. This would seem altogether unexceptional. The devil, as usual, is in the detail. The ideological intent of the move is manifest in the declared intention to explicitly include “Indian values” and “ancient Indian philosophy”. It is unlikely that those who have framed this formulation have any easy familiarity with the multiplicity of orthodox (theistic) and heterodox (atheistic) schools of Indian philosophy, with the deep traditions of scepticism and sheer moral diversity that characterised ancient Indian systems of thought. What they will imagine under this programme of study, most likely, is a mishmash of mythology and religion, with a few regressive moral homilies and an emphasis on the Hindu identity – essentially a semitised Hindutva morality. Such a value system has no coherent linkage to the infinitely divergent ethics of ancient India, much of which would shock and distress the wise men of the Sangh Parivar, whose moral universe is much closer than they imagine to Talibanised mullahs than to any stream of “ancient Indian philosophy”. What matters, then, is the profile of the trainers who may be appointed. Existing schemes give a high measure of freedom in the selection and appointment of trainers – from a large pool of school and college teachers – and this can certainly be abused by the government in power to stack the selection in favour of a particular ideological stream. It is useful, however, to note that thousands of schools and colleges have been waiting to join the National Cadet Corps programme for years. Against a sanctioned strength of 1.8 million, its current strength stands at about 1.3 million. The principal reason for the backlog is an acute dearth of trainers and finance. How “existing funds” from this and other schemes that are already in chronic deficit will abruptly create surpluses sufficient to provide for training and stipends for a million full-time participants for full-year programmes is not clear. It is significant, moreover, that an expansion of the National Cadet Corps has been a long-standing objective of this government and its predecessor. Indeed, the last regime had sought to introduce the National Cadet Corps as an “elective subject” in all universities. The Central Board of Secondary Education has also included it as an additional subject in schools, but these projects have also been hobbled by funding deficits. Again, the idea that N-Yes can be essential requirement for jobs in the military, paramilitary and police services is unlikely to be implementable, certainly till the scheme establishes its capacity to train and support all willing candidates. Despite the potential for mischief, the National Cadet Corps is under the direct control of the country’s armed forces and is unlikely to be particularly accommodating of any grave ideological distortion, given the long traditions and necessity of communal harmony and coherence within the forces. The armed forces draw their personnel from the fullest diversity of the country’s population, and have evolved a culture of integration that militates against any agenda seeking the dominance of any one communal stream, or exclusion of another. The declared objectives of N-Yes also include the transformation of India into a “vishwaguru” (world teacher or leader). It is not clear how this is to be achieved on the strength of rudimentary military training, skill development, ancient Indian philosophy and a particular interpretation of patriotism; how it is to be achieved, moreover, when the entire public education system, particularly the massive infrastructure in the incompetent control of the government, fails to deliver even a minimal quality of modern education. Instead of trying to manufacture relatively tiny contingents of dubiously “empowered” youth, the government would do infinitely better to focus on providing a better, modern and empowering education to the 260 million children in India’s schools and another 34 million-plus in higher education (according to Ministry of Human Resource Development data, 2016). The fundamental error underpinning programmes like N-Yes (and earlier efforts to introduce “military training” and “discipline” in the school system) is the faith that a faux nationalism will produce national strength. The reality is, national strength produces true nationalism. It is a modern Indian imagination, modern Indian science, technology and economics – if and when these evolve to engage effectively with the challenges of the modern world – that will translate into national strength. Minus these, all pretensions to “national pride” and assertions of historical eminence, or of reviving imagined past glories, are no more than the sorry assertions of a weakened nation, struggling to disguise long histories of defeat and enslavement, and the sense of inferiority these have left behind.